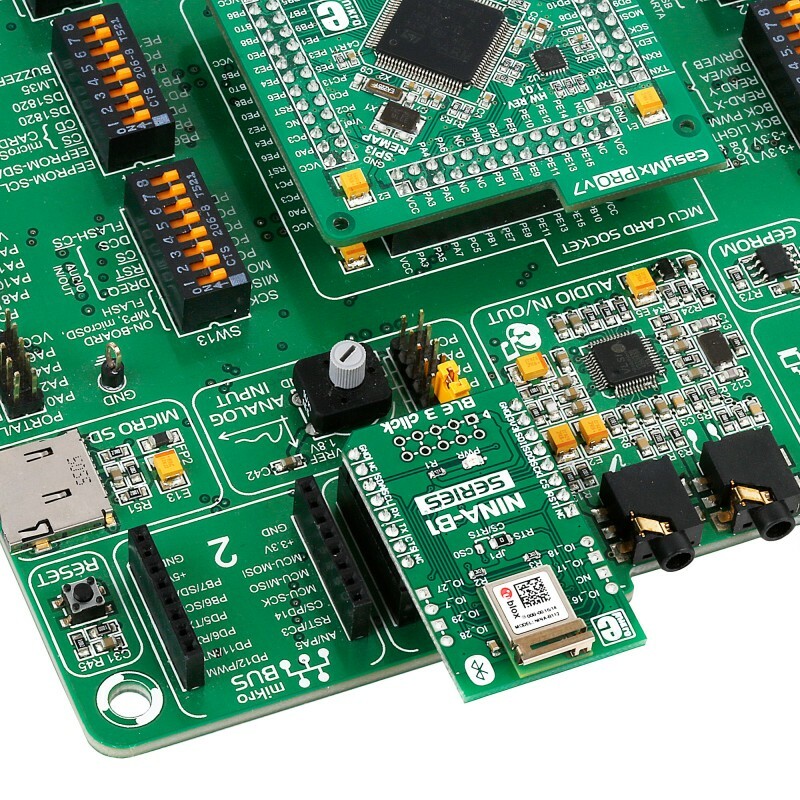 BLE 3 click is a quick and simple solution if you want to add Bluetooth Low Energy to your project. 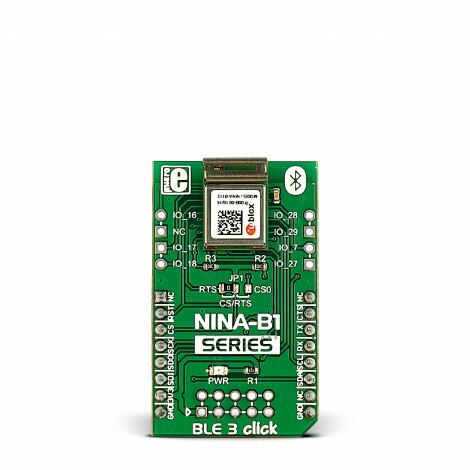 It features the NINA-B1 Bluetooth 4.2 module, from u-blox. 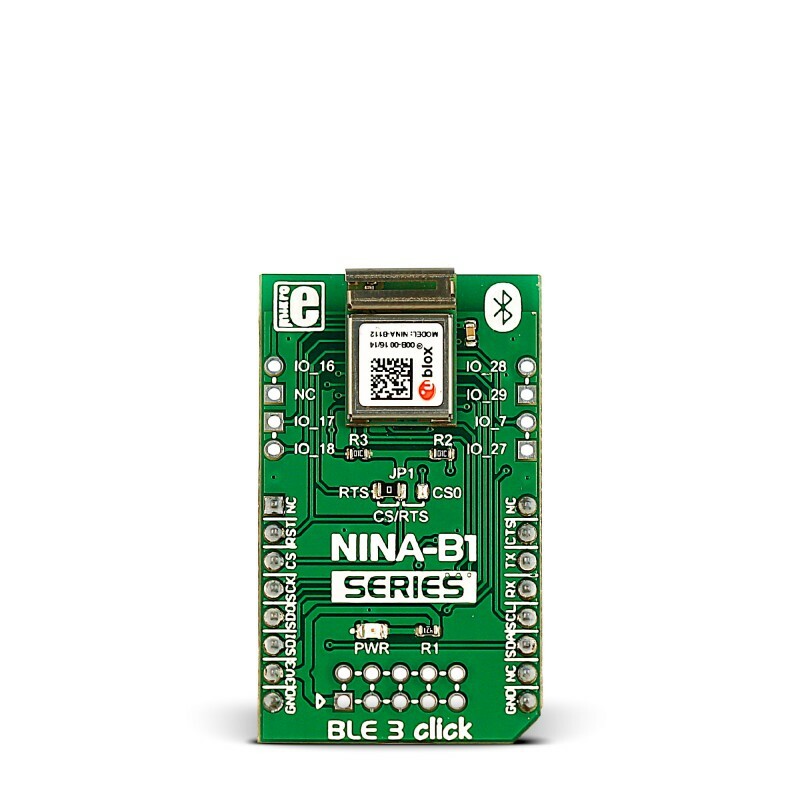 One of the standout features of the NINA-B1 module is its real time counter functionality. This counter can be used to generate precisely timed BLE advertising events (broadcasting packets to every device around), without involving the main MCU. The RTC can be operated in standby mode as well — further lowering the already low power consumption. BLE – also known as Bluetooth Low Enegry is designed for sensors and smart devices that send out small pieces of information in regular intervals and need to have very low power consumption. For example our Hexiwear uses BLE for wireless communication. You can combine BLE 3 with one of our sensor clicks, like the Air quality click, and get notified what the air quality of your home or office is all the time. For really low power consumption there are different power saving modes to conserve battery life – standby mode and power off mode. The module can spend most of the time in power off mode and wake up periodically only to send small packages of data. The ADC featured on the click can sample up to 200 kHz using different inputs as sample triggers and it supports 8/10/12-bit resolution. For applications that require it, u-blox offers Apple iOS and Google Android connectivity. The BLE 3 click communicates with the target board MCU through the UART, SPI and I2C interface, with the addition of 7 GPIO pins. It uses 3.3V power supply only. Applications Medical equipment and fitness applications, IoT devices, home automation, smart energy, etc. 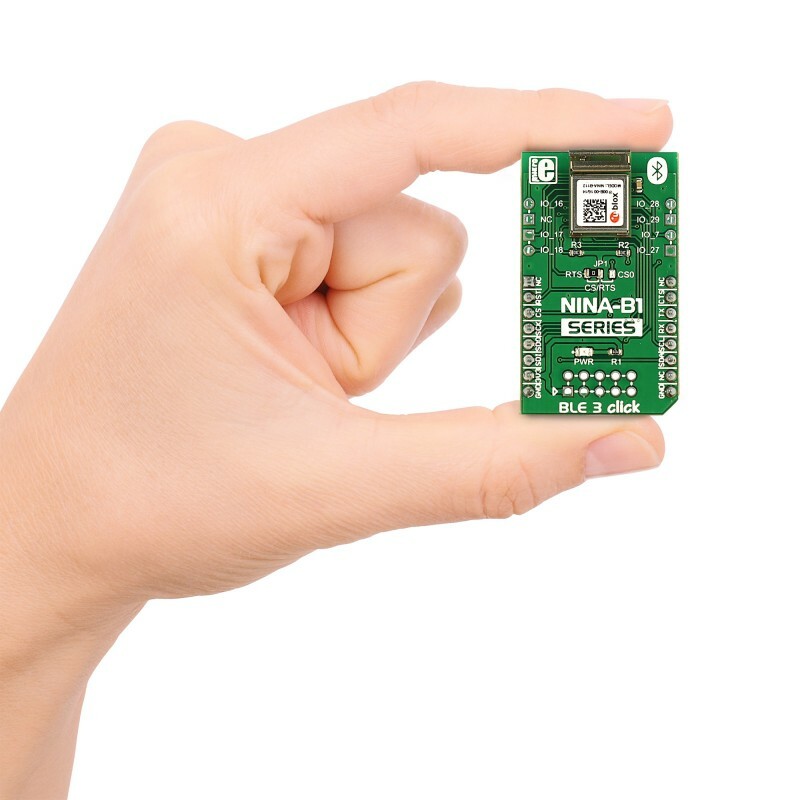 Also known as Bluetooth Low Energy, BLE is intended for small smart devices like home automation sensor and fitness applications that need to have really low power consumption and long battery life. The BLE 3 click communicates with the target board MCU through the UART, SPI and I2C interface, with the addition of 7 GPIO pins. It uses 3.3V power supply only. During standby mode, the module is clocked at 32 kHz reference clock, which is generated by an internal 32 kHz oscillator. The NINA-B112 modules have an integrated antenna mounted on the PCB (10.0 x 14.0 mm). The RF signal pin is not connected to any signal path. You can configure NINA-B1 modules through U-Blox S-Center toolbox software using AT commands. The s-center evaluation software is available free of charge and can be downloaded from the U-Blox website. 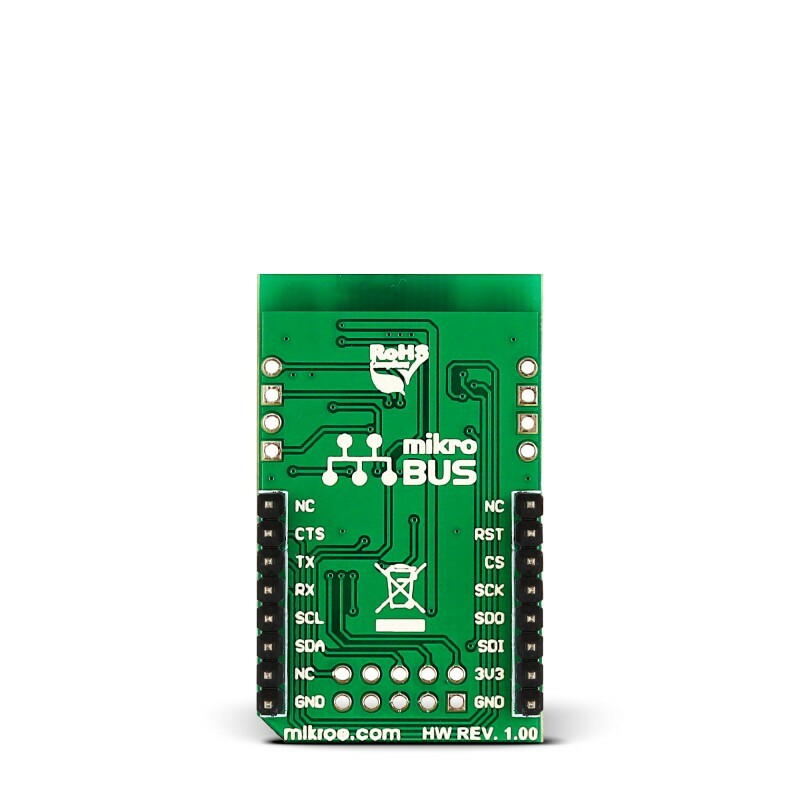 This table shows how the pinout on BLE 3 click ccorresponds to the pinout on the mikroBUS™ socket (the latter shown in the two middle columns). IO_7 I/O GPIO intended for use with a push-button switch. IO_17 I/O Analog function enabled GPIO. The demo code available on Libstock sets up the BLE 3 click to broadcast the state of pins on a desired port. A smartphone and BLE 3 can communicate when a connection is established, and the smartphone can chage the state of the pins over bluetooth low energy. The code snippet sets up the BLE 3 click in data mode, and sends the state of the pins of a port over BLE. Also, when BLE 3 receives a value from the smartphone, it will send the value over UART to the MCU, the MCU then sets that value as the value of the pins of a desired port. 29     Uart3_Write_Text("AT+UBTLN=");   // set the device name to "mikroE"